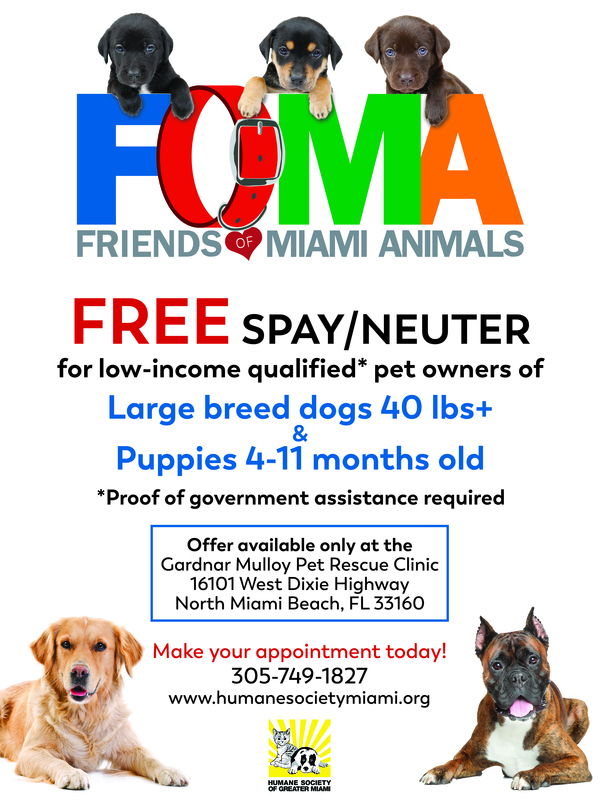 The Humane Society of Greater Miami runs two low-cost spay and neuter and preventive health care clinics to serve the pets of Miami-Dade County, one in North Miami Beach and one in Cutler Bay. Click here to learn more about the vaccines and other preventive care services and prices for both clinics. *offer excludes complications. Price subject to change without notice. The North-Dade clinic is located Soffer and Fine Adoption Center; 16101 West Dixie Highway, North Miami Beach, FL 33160 (Get Directions.) 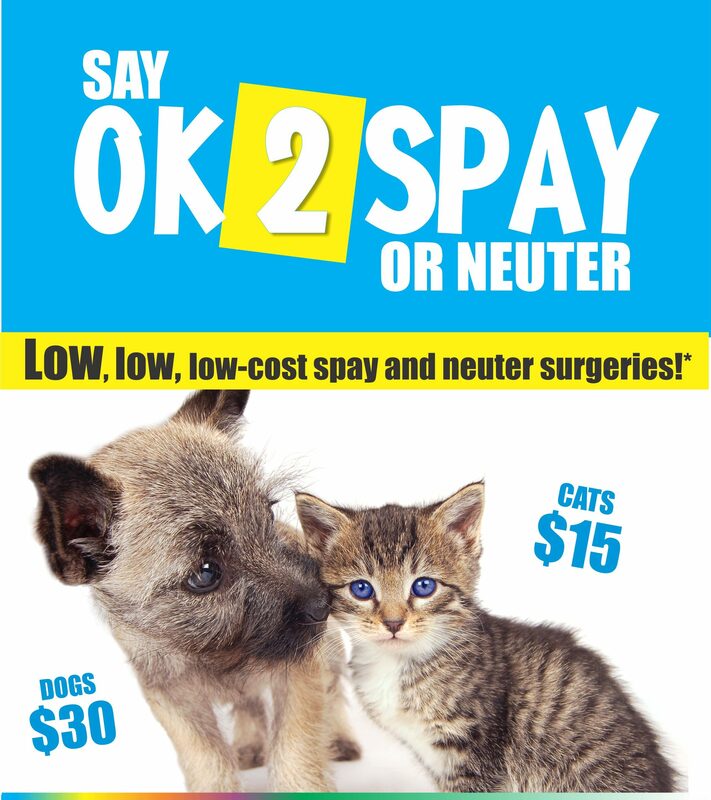 Click here to schedule an online Spay/Neuter appointment request or call 305-749-1827. Walk-ins on space-available basis for cats no later than 8:30am. 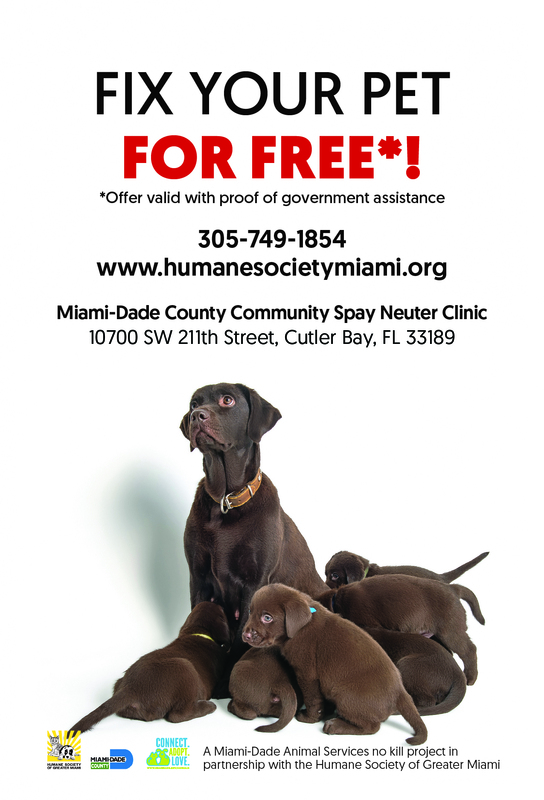 The Miami-Dade County Community Spay Neuter Clinic is located in Cutler Bay at 10700 S.W. 211 St., Miami, FL 33189 (Get Directions.) 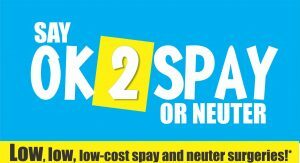 Click here to make an online Spay/Neuter appointment request or call 305-749-1854. Walk-ins on space-available basis. In the best interest of your pet's health, all vaccines and dewormers must be administered 2 weeks prior to surgery. If a female is "in heat", there will be an additional $20 charge; if she is pregnant, there will be an additional $20 charge. If a male has one or both testicles retained, there will be an additional $50 charge. In the best interest of your pet's health, all vaccines and dewormers must be administered 2 weeks prior to surgery. If a female is "in heat", there will be an additional $30 - $50 charge; if she is pregnant, there will be an additional $40 - $50 charge. If a male has one or both testicles retained, there will be an additional $60 - $80 charge. What is spaying/neutering and why should I have it done for my pet? Spaying and neutering are the surgical sterilization of an animal. It is a routine surgery performed by a veterinarian while an animal is under general anesthetic. The procedure consists of removing certain reproductive organs: in females, the uterus, oviducts and ovaries; in males, the testicles. Under proper veterinary care there is little risk. The animal is usually up and about within one or two days. 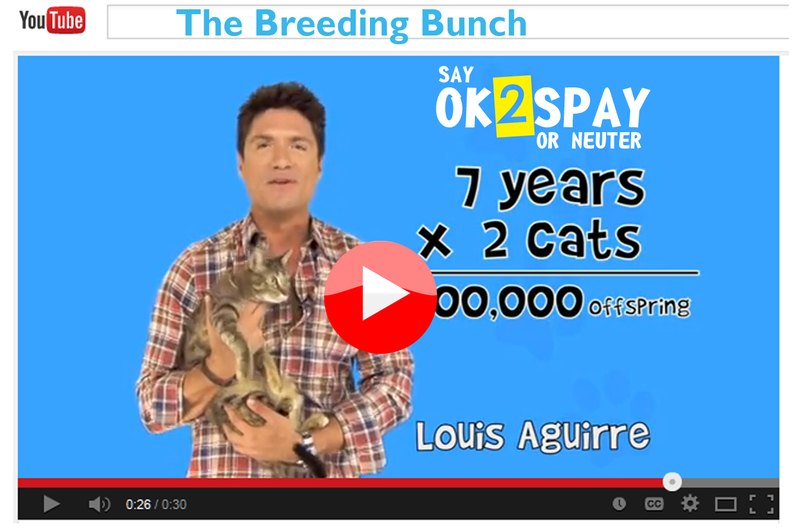 “Spaying” refers only to female animals; “neutering” can be used in reference to both male and female animals. A spayed or neutered pet will live a longer, healthier, happier life, will listen better and be easier to train, will be calmer and more affectionate, will be less likely to roam, run away or fight with other animals and will NOT add to the pet overpopulation problem. Important: Check-in for surgeries with appointments is 8:00am at our North-Dade clinic and 7:00am to 8:30am at our South-Dade clinic (check-in can take 30-60 minutes, so please plan accordingly). After 8:30 am, all surgeries with appointments lose their priority status and become walk-ins subject to space available. In preparation for all surgeries, pets must be fasted (NO food or treats – water is OK to prevent dehydration) from 8pm the night before surgery. In the best interest of your pet’s health, all vaccines and dewormers must be administered 2 weeks prior to surgery. **Please Note: If your cat or dog has a pyometra, the doctor will decide whether or not we can perform the surgery. If surgery is performed, the additional cost to the regular spay price can range from an additional $50 to $500. We are NOT equipped to perform emergency pyometra; please go to a private veterinary hospital, emergency clinic or veterinary surgical hospital.